In a rapidly changing and disruptive world where life‘s ever increasing challenges force even the bravest individual into a state of fear and mass distress, here comes the voice of reason, the Think-Shifter. Alex Granger transcends both change and chaos, and has helped businesses and individuals achieve purpose and possibility. Alex is a Global speaker and Author. He delivers dynamic keynote presentations to thousands of delegates each year, inspiring ordinary individuals to accomplish their goals and dreams, and helping businesses to adopt a new and more meaningful purpose, and profitable vision. As a key resource for conferences, strategic sessions, people development and business interventions, Alex has that rare ability to shift mindset, presenting new insights and diffusing complexity. 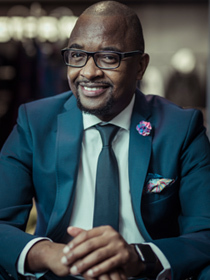 He completed an Executive Leadership Development Program (ELDP) from the Gordon‘s Institute of Business Science with a distinction in Leadership. He is also a certified NLP practitioner. Alex has worked in executive and senior leadership positions for blue chip companies such as Bidvest, Imperial, Standard Bank, Altech Group, G4S Solutions and Tsogo Sun. There is a Chinese saying that, “Every generation produces its own great character, and each has impact for hundreds of years.” The compelling story of giant Huawei is one of how a leader can lead with heart and move with mind. Covering such key aspects like “purpose-driven ambition”, “adaptive vision”, and “cooperative mindset”, Alex draws great leadership lessons from a large enterprise that can be used in any size of business. Key take home value: Delegates learn how ordinary leaders can transform organizations into international powerhouses that generate huge profits. Leadership is in danger. Complacency is becoming the new normal. With the mounting pressure and demands of change management, leaders must carefully pick and choose their battles. In their efforts to propel action and secure the required investments, many grow frustrated as measurable progress towards moving the conversation forward gets caught in the corporate noise that surrounds them. More than ever, leadership has become an exercise in survival of the fittest – and as a consequence, those leaders who have grown more complacent, are finding it difficult to maintain their competitive edge and thought-leadership footing. Leadership in the 21st century requires mental toughness, stamina and patience. Alex provides key insights on how a leader’s credibility and incredibility can make them more successful. Key take home value: Leaders will have a fresh perspective on how to develop credibility and authenticity, and how interpersonal skills can enhance staff performance and improve business results. How can you equip yourself to be that sales professional, that sales guru, that deal magnet? How do you deliver value, engage with your customers, influence decision makers, and not only close the deal, but at higher profit margins than most? Alex will show you how to create conversations that seal deals, build trust that anchor relationships, and provide value for your clients. Key take home value: A fresh approach on selling strategies in the new economy, tactics that really work, and an improved sales skill set. For centuries, the creative art of storytelling has been a prominent feature in traditional history. Now Alex illustrates how you can use storytelling as a leadership tool, communication tool, and presentation skills tool. This is a workshop presentation, highly interactive, with practical lessons throughout the session. Key take home value: Delegates learn practical leadership, communication, and presentation skills, with immediate improvement during the session. I believe that each one of us is a force of nature. Within us lies great ability and capability to outperform the very best in our fields. We struggle with various fears and doubts, but still, we are a force to be reckoned with. In “FORCE”, I share the success code for personal effectiveness through this riveting keynote, driven by five key traits (in the acronym “F.O.R.C.E.) that awaken the force within you. There is no doubt that the winners in business today are those who break the rules and chart new, creative courses of action. Often, these trailblazers are running new, entrepreneurial businesses, but just as often, they head some of the biggest names in business. But what do individuals, these last mavericks, have in common besides being branded as mavericks? What do they do that others don’t? How do they think? What differentiates extraordinary performers from everyone else? When you consider the best, how can you outperform them? In this thought provoking keynote, Alex shares 5 key insights on becoming a maverick and how individuals and businesses can outperform the very best in their industries and create successful futures. Key take home value: Delegates learn how to disrupt patterns in their own lives, create new normals, boost ambition, make better decisions, develop greater focus, and self improve to become the rare top performers known as the last mavericks. In a difficult global economy, businesses need to introspect and question whether they are fit for purpose. Are your people fit for purpose? The definition of “fit for purpose” is “anything that is good enough to do the job it was made for”. How do you develop fit for purpose leaders, culture, and PEOPLE? Using a 7 step methodology, Alex shares insights on how people can be developed and made future fit for purpose. Key take home value: Tools and techniques on how to transform people and empower them with tools to become fit for purpose. Excellence isn’t a list of to-do’s. The way to excel in your field and in your business is the degree to which you are purpose driven. Your why, in other words, matters more than just your what. In this incredible presentation, Alex illustrates the importance of purpose in business and how purpose drives productivity by enhancing strategy, vision, and mission. The performance code is a methodology that helps individuals to improve their individual performance, resulting in business performance improvement. Key take home value: A clearer understanding of purpose in business, the performance code, and the 5 steps to achieve top performance in your life and your business. How do you ensure that your business survives? How do you create a winning attitude, and how do you not only think like a business champion, but also DO what champions do – WIN? In this presentation, Alex shares 7 practical steps to develop mental strength for championship thinking and doing to ensure that your business remains sustainable. You will learn what NOT to do in business and the imperatives for success. The focus is in the magic that creates those moments of truth for customers, staff, and stakeholders.But the biggest challenge is in translating how you THINK into what you DO. How does one achieve greatness? What is greatness? Is it success perhaps? Wealth? Or is it the impact of your selflessness? The significance of giving? Greatness is the ability to live a life that impacts others in an inspirational way It is within you! “You tailored your presentation to fit our needs. Your talented performance caught our attention and left everyone feeling inspired. We received positive feedback from everyone. You have such an infectious and charismatic presence, that we look forward to working with you again in the not too distant future.”- Cordelia Orson-White, Human Resources: Atlas Copco Busines Services.